Boiler Maintenance | Atlantic Refrigeration and Air Conditioning, Inc.
With the end of winter, we’re seeing temperatures start to improve around here. However, it’s far too soon to be saying that we don’t need our heaters! We’ll be running them for just a bit longer, especially during the night. But as you do, please keep your boiler in mind. It has been running since the beginning of the season. If there are any dormant repair issues in your boiler, they’ll most likely start showing up after all of this continued use. 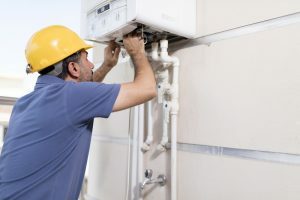 How Often Should I Schedule Boiler Maintenance in Lewes? Your boiler is a complex device that works hard during the winter months to keep you warm and comfortable. It is not unusual for it to accrue wear and tear each season, including the accumulation of dirt and dust. Operating your boiler season after season without scheduling maintenance can reduce the energy efficiency of the system by up to 5% each year. This is one of the reasons why it’s so important to schedule boiler maintenance in Lewes. The cold weather is coming, so don’t hesitate to schedule maintenance with your Atlantic Refrigeration technician today. Better energy efficiency – your boiler was made to operate at a certain efficiency level. When the system and its components are worn down from seasonal operation, it can be difficult for your system to operate as efficiently as it should. During a maintenance appointment, components are cleaned, adjusted and lubricated, allowing them to operate as they should. This helps your system retain its original energy efficiency. Prevents repairs – during a maintenance appointment, your system undergoes a thorough inspection. This inspection allows the technician to look for and detect any existing or developing issues with your boiler. Small issues, like frayed wiring, will be repaired during the maintenance appointment; larger issues will be reported to you so that you can schedule an appointment for repair. Resolving potential and existing problems immediately can help prevent repairs down the road. Less wear on your system – a system that operates under stress for a long period of time due to a lack of regular maintenance can prematurely age. Properly maintaining your boiler keeps the system and its components in good working order, which helps prevent early aging. Ideally, maintenance should be scheduled bi-annually: before the heating season in the fall, and after it in the spring. However, if you can’t schedule maintenance bi-annually, it is strongly recommended that you schedule it annually, with the best time being in the fall season. If it’s been more than 12 months since your last boiler maintenance in Lewes, call the boiler maintenance professionals at Atlantic Refrigeration today. Posted in Heating | Comments Off on How Often Should I Schedule Boiler Maintenance in Lewes?